NOTE: THE DATE OF THE EARTHQUAKE WAS POSTPONED BY OUR INTERCESSzORY EFFORTS. HOWEVER, BECAUSE OUR WARNINGS HAVE NOT YET MET WITH SYSTEMIC CHANGE AT MICO & MACRO LEVELS OF SYSTEM, WE HAVE REVISED OUR PREDICTED DATE OF THIS EARTHQUAKE CATASTROPHE TO BETWEEN MARCH 8 & MAY 31 “2015”. WE ARE CONTINUING INTERCESSZORY PRAYERSZ & ACTIONSZ TO MITIGATE MAGNITUDE & DAMAGE, BUT PARADIGM MUSZT CHANGE NOW & RETROACITVELY VIA CORPORATE MEDIA PATRIARCHAL PERPETUATOR APOLOGYESZ. This Information was Given to CBS News Around February 22, 2014, and is now urgently being communicated to a larger worldwide audience. 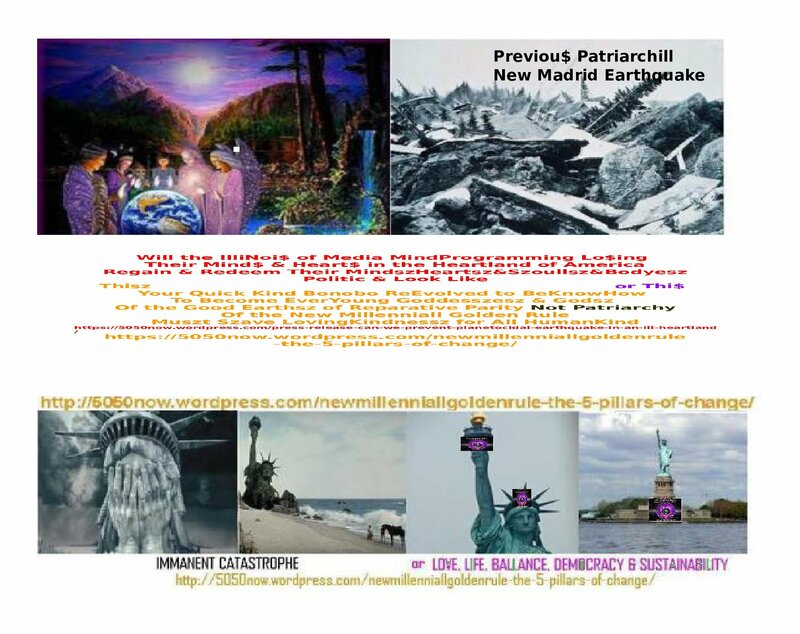 URGENT EARTHQUAKE/DISASTER WARNING TO THE PEOPLE OF ILLINOIS & NORTH AMERICA’S HEARTLAND, & BY RIPPLE EFFECT, THE WORLD InterConnecting Gaia Hypothesis Preventing Systemically Related Illinois Faults and Earth Extinction Threatening Volcanoes, Landslides and Ice Storm Weather. TIME TRAVELLE BACKWARD to 2000, over 200, and 8000 years ago AND FORWARD AGAIN FOR GAIA/MarIAm in New Millennia. A Chicago “Heartland” born WOMAN currently living in Maryland, Dr. Rajchelle Onefamily ~Popper~Margulies~Silverkind~Zalkind~, with a Ph.D in systemic psychology-anthropology of kinship geneallogicall systems, and lifelong public service including a write-in candidacy advocating gender balance, family work balance and whollistic health, and environmentalist protection especially as a solar energy advocate, who has stated she is a First but Not Last or Only SaviorCoSavior, with You, of the Planet Earth, is warning of an immanent but currently easily preventable PLANETARY disaster, centering in nuclear plant and waste-laden Illinois’ New Madrid Earthquake fault, but transmitting to and affecting the entire Planet, most likely during the period on and between Friday February 28 and April 18th ~Earth Day, with an even more serious Quake on Mother’s Day, May 11th, if this information and the urgency of implementing THE NEW MILLENNIALL GOLDEN RULE https://5050now.wordpress.com/newmillenniallgoldenrule-the-5-pillars-of-change /which she has been Delivering With Calling & Divine Guidance, is not heeded. Dr. Onefamily believes that by having verifiably given this predictive warning in advance of the event, the magnitude of the disaster will become either prevented or more limited, and allow Mother Nature to simply give a clear and heedable WAKE UP CALL AND WARNING TO THE REGION AND PLANET regarding its deep systemicallly interconnected degrading and exploitative/cooptive attitudes toward women and attitudes toward Nature due to past peak Patriarchy, rather than cause extreme devastation, and a true “Beginning of the End” and negative cascade of ripple effect disasters worldwide, for Planet Earth. The Zion Nuclear Power Plant near Chicago had a fire on February 13, 2013, http://newssun.suntimes.com/news/18230414-418/cutting-torches-spark-small-fire-at-zion-nuke-plant.html that was deemed of no importance, but was a deep systemic symbolic harbinger of the current and cumulative interactive risk, co~occuring with frakking, known to set off “small earthquakes” http://stateimpact.npr.org/texas/2012/02/08/how-fracking-drilling-and-earthquakes-are-linked/ (the fire that set off the famous Chicago fire that destroyed most of the City in a previous century, was, initially, quite small) of the Marcellus Shale of the region and much of North America. All these events are co~occurring while women of this region and all of North America are “too busy” coping with patriarchal pressures on them, to talk about their gender’s lack of representation, even to listen to one another, even women in their own and interconnecting families, any more than men in “power” do, and how this effects policy and “law” impacting both preventive whollistic family health and life protection, and the human relationship to Nature, whose unleashed power, whether for good or ill (inois) dwarfs all still strangely mostly male and female tokenizing officialdom. Dr. OneFamily is a not very distant relative, with shared geneallogical surname of her and her next generations, of LYN PetRa (interesting sharing this name with Petra Kelly, founder of the Green Party) ALEXANDER (the name means World Saver)~SAGAN~MARGULIS, THE MOTHER OF THE GAIA EFFECT HYPOTHESIS, a famed biologist, who was also from Chicago, a diversely populated city in the Heartland of North America. Then name Margulis/Margulies/Margolyes is a very ancient one meaning Pearl or Gold/Jewel of the Flow or Sea, and actually connects, via intertwining geneallogy, with additional, branches of the human family from which world saving is traditionally Biblically predicted, intertwining, in fact, with all branches. Dr. OneFamily regards this urgent warning and her plan to avert disaster to be such an act of a First but Not Last or Only World Savior, which she also states, everyone can become if they heed her simple prescription, her Given and Delivered New Law, the New Millennial Golden Rule, http://5050now.wordpress.com/newmillenniallgoldenrule-the-5-pillars-of-change/ as Daughter of the MotherFatherGoddessGod, of Mother Nature assisted by Father Time, and doctrine for preventing such disaster. Again, it is preventable via a few simple but deep systemic actions, simply implementing the New Millenniall Golden Rule, the New Law which Dr. Onefamily, acting as a Planet Saver, for All the World, starting with legal entities that have been interacting with her own familycommunity, that has retrospectively and remains currently embroiled in conventional and “legal” and “governmental” confusion and anachronism that has been most recently centered in Illinois and around the New Madrid Fault region. The New Madrid region is where not only her and Lyn Alexander~Sagan~Margulis interrelated family, but also Amy ~Merrit ~Rule and Rahm ~Merrit ~Rule ~Emanuel , Michelle and Barak Robinson~Obama, and Hillary Hallowell~Clinton and her husband Bill Cassidy~Hallowell~Clinton, and an Illinois “father’s daughter” Attorney General Lisa ~Madigan (her Mother’s and any other women of the family’s name is ommitted from Wikipedia biographies of her and her political dad; synchronistically, even the ~Madigan patronym includes both the “Ma” and “Mad” imbedded in the name of the New Madrid Fault) and many others came from), and has, through complex processes, especially of cooptation, been causing all to divide women, and reneg on and delay overdue change, spread an anachronism throughout North America and the world. Indeed, the US emergency preparedness agency, FEMA, embeds the beginning of the word FEMALE, truncated, tokenized and reactive, instead of fully represented, personally and globally connecting and proactively powerful, and is a sound alike for the feelings of the great MA, Mother Nature, but institutionally and culturally “hidden” from awareness. This error has impacted North America not only since the ignoring of the famed ReEvolunary Essay Common Sense, delivered in 1776, but for the 8000 years since the eruption of Mt. Thera which occurred when the Minoan Civilization which was egalitarian began to become more Patriarchal, and also gave rise to many of the Natural Events of the Biblical Exodus saga, such as the Red Sea Tsunami, and must be addressed retroactively and presently as well as proactively for the future, by both known related family at the micro level of her own family and community systemic process and as well as with all world government officials and media at the macrolevel of systemic process, in Illinois, North America and Worldwide and assisted by all, and of course, by MotherFatherGoddessGod’s, Mercy, which also must reside Within, Between and Among All the Children of OneFamily of Planet Earth. Due to complex factors that can be easily understood and remediated, all these families have reneged and regressed from necessary gender reparative coleadership in obeyance of systemic Laws of Nature. By emergency remediative and retroactive announcements, with the Adult Women, and then calling forth their Next Generations under age 37 female and male, of hopefully these and any or all of the world’s most prominent families, acting in deference to and cooperation with equally important geneallogically linked but lesser known families of even deeper Loving and Ecologicall wisdom, Dr. OneFamily is calling forth “the reall CoMayors, CoGovernors, CoPresidents and CoSecretary Generalls in Emergency Receivership in Common Sense,” around the world, as geneallogically interconnected Children of OneFamily, without reference to false hierarchy, to exercise New and Retractive Law Making authority, under the New Millenniall Golden Rule https://5050now.wordpress.com/newmillenniallgoldenrule-the-5-pillars-of-change/, a true Guide or E~Manual, in fact, EmanuElle, to Sustainable Life of Humanity in Harmony with One Another and With Nature. Mary Lambert’s husband Tom ~Lambert~Paine called for equal representation of women, no slavery, exploitative servitude or property/financial barriers, and full representation of people of all hues and origins, in his more truly ReEvolutionary call for democracy, in the famous essay Common Sense in January and February 1776, but was subverted by patriarchal and elitist primative anthropological tendencies toward false hierarchies that were even then an affront to the human Heart and Nature, in the Constitution of 1789. Now, 14 years past the Millenniall 2000 year, which was meant to bring forth a more Enlightened Era in Heart, Mind, Spirit and Body Politic, time has run out on patriarchal paradigms of decision-making and economics, which result in extreme disharmony with Nature, cumulatively and interactively, over Time. The complicit payment of taxes by hundreds of millions of media misinformed, misled adults, to pseudogovernment that does not represent and co-opts the female gender and all people, is the macro-level Sin which will precipitate the Sodom and Gomorrah-like Earthquake, but many people in her own and every family is also currently in a condition of extreme sinful imbalance and neglect of the Eternal Feminine/Mother Nature. Similar Quakes may occur in other regions simultaneously, all for the same underlying situation of social imbalance which gives rise to technologies that exploit and harm the Mother Earth. This Disaster human and earth interaction disaster is predicted to occur mostly likely between FEBRUARY 28, between this date and March 8, often called International Women’s Day. (within two weeks of an important ~Margulies~related She Kin and leader of family and community democracy, family matriarch Harriet’s’s passing just before Valentimes Day in 1988, as well as the first publication in 1776 on Valentimes, of Common Sense by Mary ~Lambert’s husband Tom Lambert Paine , which called for equal representation of women as well as all people that has remained subverted since 1789, and the February 15 birthday of Susan B. Anthony, who also called for equal representation for women, not simply the vote,). 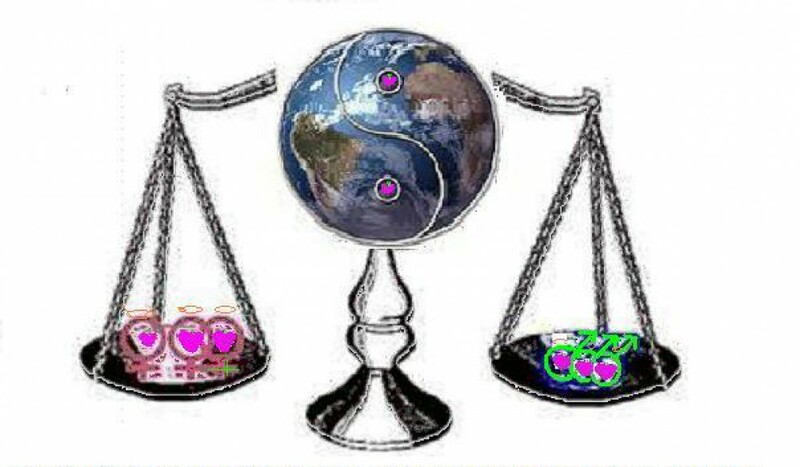 By her Intercessory Spirituall activities, Dr. OneFamily saysa the Quake might be delayed somewhat, but will certainly occur by Earth Day April 22, and possibly repeat on Mother’s Day May 11 even more extremely with incalculable damage, if the need for balance of gender in political, economic and Spiritual paradigm, the New Millennial Golden Rule, https://5050now.wordpress.com/newmillenniallgoldenrule-the-5-pillars-of-change / is not announced by titular government and widespread media. The disaster can be either be mitigated or delayed, slightly, or completely avoided, based on events & speed of implementation of Dr. Onefamily’s doctrine of the New Millenniall Golden Rule https://5050now.wordpress.com/newmillenniallgoldenrule-the-5-pillars-of-change/ is acknowledged and heeded by both known related family at the micro level of her own closest and known geneallogicall family and community systemic process and/or as well as with government officials and media at the macrolevel of systemic process, in Illinois, North America and Worldwide and assisted by all, and of course, by MotherFatherGoddessGod’s Mercy and Grace. Dr. OneFamily believes that the immediate precipitant to the event will be likely caused by marginalized communication among sisters and related women from this area and their involved and related communities in North American government, co-occuring with a nuclear or frakking occurrence in the region that patriarchal processes affecting women in North America cause them to fail to act intelligently to prevent.